The latest revision and addition to the Strike-X family, the Advance Devil Red offers a multitude of improvements and a stunning red colour scheme. Features include support for longer high-end VGA cards up to 295mm, allocation for 9 x 5.25" bays and maximum 6 x 2.5"/3.5" HDDs (internal) with HDD convertor bracket, anti-vibration pad included to dampen PSU vibration, "easy-install" screw-less kits for the 5.25" devices. There is also a CPU access hole on the motherboard tray for easy access to install the CPU cooler with ease. 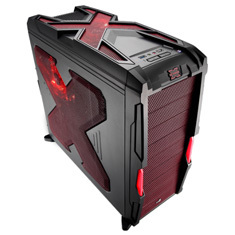 Aggressive "X" concept design case - a gamers' dream! Supports longer high-end VGA cards up to 295 mm. Supports 9 x 5.25" bays and maximum 6 x 2.5"/3.5" HDDs (internal) with HDD convertor bracket. Anti-vibration pad included to dampen PSU vibration. Each HDD bracket can mount a 12cm fan to cool HDD individually. "Easy-install" screw-less kits for the 5.25" devices. 1 x USB2.0 + 1 x USB3.0 and Audio/Mic ports are easily accessible from the top of case. CPU hole is pre-drilled on the Motherboard for easy access to cooler installation. Cable management holes are pre-drilled with high end rubber protection. Dust filter included to prevent dust entering from the bottom of case.